Asset Order is an active financial organization complementing fundamental company standards with industry, sector and regional components. We aim to manage assets of companies that are creating value for their shareholders by achieving rates of return on their invested capital that exceed their cost of capital. 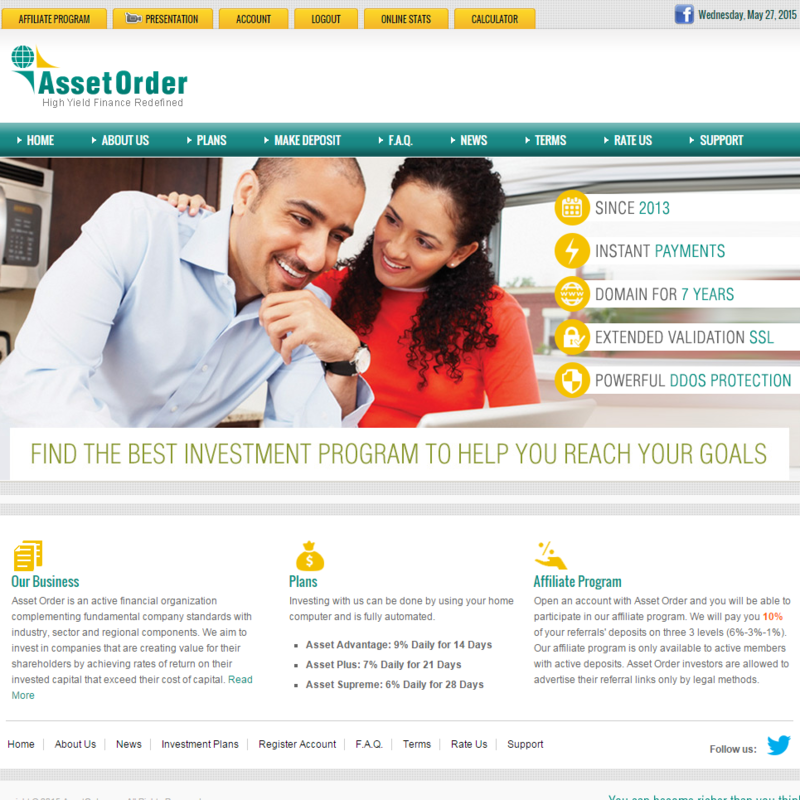 Successfully working in the investment field for over 2 years now, Asset Order has a strong team of experienced experts. 05.27.15 05:51 Account Transfer -150.00 Sent Payment: 150.00 USD to account U7543932 from U4731311. Batch: 90502163. Memo: Shopping Cart Payment. Deposit to Asset Order User monitor-invest.net. Last Edit: 3 years 10 months ago by Moderator. 27.05.15 19:39	Transfer	Sent Payment: 20.00 USD to account U7543932 from U4584***. Batch: 90557200. Memo: Shopping Cart Payment. Deposit to Asset Order User sbykov. 05.27.15 19:42	Account	Receive	+1.38	Received Payment 1.38 USD from account U7543932 to account U4731311. Batch: 90557448. Memo: API Payment. Withdraw to monitor-invest.net from Asset Order. 05.28.15 09:16	Account	Receive	+13.5	Received Payment 13.5 USD from account U7543932 to account U4731311. Batch: 90588823. Memo: API Payment. Withdraw to monitor-invest.net from Asset Order. 28.05.15 20:15	Receive	Received Payment 1.8 USD from account U7543932 to account U4584***. Batch: 90641249. Memo: API Payment. Withdraw to sbykov from Asset Order. 05.29.15 09:06	Account	Receive	+13.68	Received Payment 13.68 USD from account U7543932 to account U4731311. Batch: 90669889. Memo: API Payment. Withdraw to monitor-invest.net from Asset Order. 29.05.15 20:05	Receive	Received Payment 1.8 USD from account U7543932 to account U4584***. Batch: 90714688. Memo: API Payment. Withdraw to sbykov from Asset Order.